Deciding whether to get a pet? Already have a pet? Loving and caring for a pet enriches the lives of many children. Consider safety as well as benefits when deciding if it’s time for a pet in your family. Remember owning a pet can be a long term commitment. How can I keep my child safe and healthy around pets? Choose pets wisely. If you don’t already have a pet, take care to choose from breeds and species that are likely to be good with your child. Have the pet checked for diseases by a veterinarian before bringing it home. Consider any family allergy problems. There is some evidence that early exposure to animals may lower a child’s risk of developing an allergy. Discuss allergy concerns about pets with your child’s health care provider. Always supervise interactions. Teach your child not to go near any animal unless you say she may do so. Never leave a young child alone with an animal. Even a gentle pet can harm an infant. Toddlers often hit, poke, or grab animals, which can provoke an attack or harm a small pet. Teach your child to play gently with pets. Be sure your child stays away from pets when they are eating, caring for their own babies, or sleeping. Encourage good hygiene. Keep your child away from the litter box or animal food bowl unless he is helping to fill it. Have him wash his hands after playing with a pet. Treat any animal bite or scratch immediately. Check with your child’s pediatrician if any bite or scratch breaks the skin. 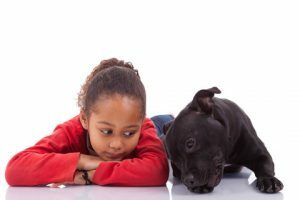 How can my child benefit from growing up with pets? Self-esteem and social skills. Having positive feelings for and experiences with pets can help children feel good about themselves. Children often enjoy talking to an animal. Loving a pet can also help children learn to love and trust others. Physical activity. All pets need exercise. Playing safely and appropriately with pets is a fun way to help make physical activity a part of your child’s lifestyle. Responsibility and respect. Learning to take good care of pets can teach children to express concern, empathy, and responsibility for other living things. Parents can use pet care to model and teach respect for all living things. Over the pet’s life cycle, parents have opportunities to teach lessons about birth, illness, and death. Parent involvement. Parents and children can share time together as they play with and care for their pets. How can my child help with pet care? A young child can help in small ways but can’t be responsible for all of a pet’s care. He may be able to feed the dog if you premeasure the food, for example. He can walk with you and the dog, but he shouldn’t walk the dog alone. Give your child safe, small tasks, and be sure to supervise him as he does them.